A Scoot flight from Singapore to Taipei on Sunday experienced abnormal cabin pressure during the plane's descent, resulting in the activation of oxygen masks. Flight TR996 landed at 1.15pm at Taipei's Taoyuan International Airport. A passenger who was travelling with her child reported that her infant vomited during the descent, said a Scoot spokesman in response to queries from The Straits Times. A passenger on the flight said the pilot had announced that there were problems with the aircraft, resulting in the dip in cabin pressure. 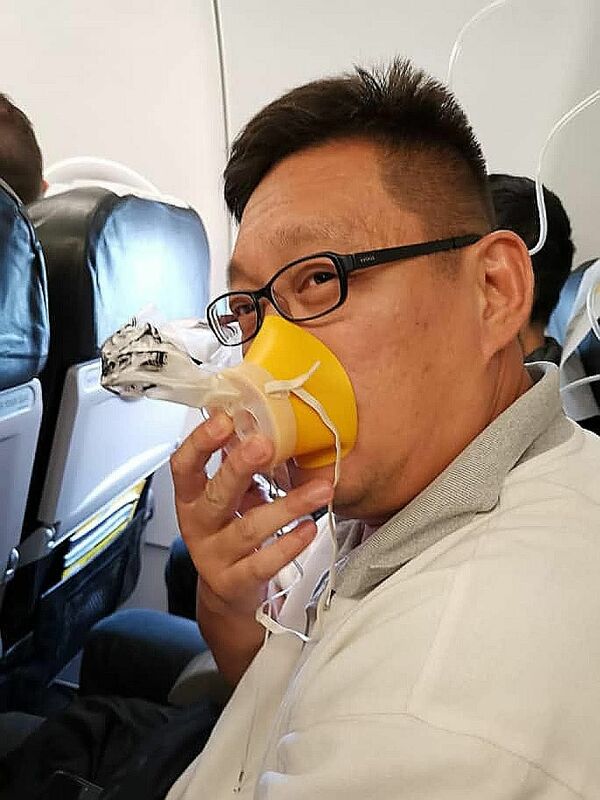 The oxygen masks were activated during the Scoot flight from Singapore to Taipei when it experienced abnormal cabin pressure during the descent and the aircrew told passengers to put them on (above). Scoot said that all passengers of TR996 disembarked from the plane when it landed safely at 1.15pm local time at Taoyuan International Airport. Passengers booked on the return Flight TR997 from Taipei to Singapore were affected by the incident as their flight was delayed. The Scoot spokesman said that Scoot would deploy a replacement aircraft, subject to regulatory approval. The flight eventually departed from Taipei at 1.16am yesterday and arrived in Singapore at 5.39am. It had originally been scheduled to depart at 2pm local time on Sunday. Meal vouchers were given to passengers at the airport during the delay, said the Scoot spokesman, who apologised for the inconvenience caused to its customers.